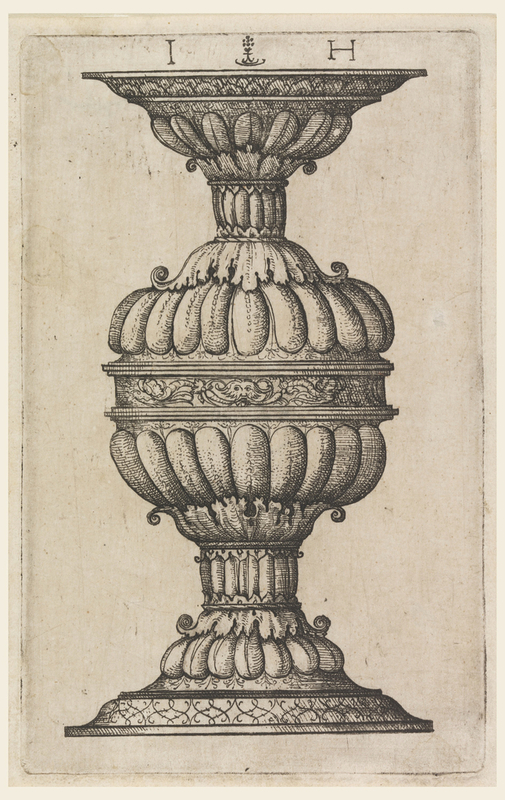 In 16th century Germany, the popularity of Doppelpokal, better known as double goblets or cups, and the taste for elegant, classicized forms are reflected in this small print by Hieronymus Hopfer (German, active ca. 1520-1530). As the ancestors of wine glasses, double cups, which fit over each other at the rim, were intended for ceremonial purposes such as weddings, and prized by merchants and collectors. This remarkably well-preserved print illustrates two goblets ornamented with grotesques and fine arabesque and acanthus patterns. The print dates to about 1530-1540 and was made using an etched and engraved metal plate. The resulting details are diminutive yet rich and indeed this design is one of the smallest prints by Hopfer. His attention to detail, perspective and texture indicates that the print was perhaps proposed to a silversmith as a working design that might later be realized in gilded silver. Hopfer’s design takes its inspiration from Italy, and indeed was copied after Albrecht Altdorfer’s print Three Goblets against a blank Background (1530). Even though Hieronymus Hopfer produced a copy, he found ways to personalize this print, going as far as to replace Altdorfer’s monogram on the rim with a frieze of grotesque elements, suggesting his ingenuity and keen attention to detail as a designer. Timothy B. Husband, and Jane Hayward, The Secular Spirit: Life and Art at the End of the Middle Ages (New York: Dutton Publishing, 1975), 269. ← Have You Seen this Matisse Mural?